Meralgia paresthetica is an entrapment neuropathy of lateral femoral cutaneous nerve resulting in pain in the outer thigh. 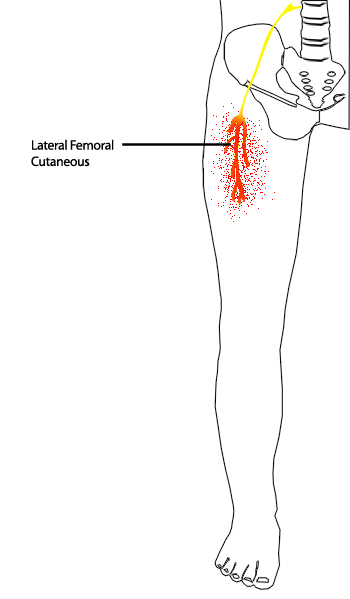 Lateral femoral cutaneous nerve is a sensory nerve that supplies the lateral aspect of the thigh. Meralgia paresthetica comes from the Greek words meros (thigh) and algos (pain). The compression of the nerve commonly due to focal entrapment of this nerve as it passes through the inguinal ligament. Rarely. It can occur due to direct trauma, stretch injury, or ischemia. The reported incidence of meralgia paresthetica is much higher in patients with diabetes mellitus than the normal population. No gender predilection is seen. It may occur at any age but middle-aged people are most commonly affected. Lateral femoral cutaneous nerve originates directly from the lumbar plexus and is formed by nerve root innervation from L2-3. The nerve runs through the pelvis along the lateral border of the psoas muscle to the lateral part of the inguinal ligament. It passes to the thigh through a tunnel formed by the lateral attachment of the inguinal ligament and the anterior superior iliac spine. The crossover into the thigh is the most common site of entrapment. The main complaint of the patient is painful paresthesias and numbness of the upper lateral thigh area are the presenting symptoms. Most cases affected on one side only. The symptoms are bilateral in up to 20% of cases. The symptoms are aggravated by walking or standing and are relieved by sitting. On examination, there is numbness of anterolateral thigh either in all or in parts. Some patients are found to be hyperesthetic [increased sensation]. The symptoms may be reproduced by tapping over the upper and lateral aspects of the inguinal ligament. Extension of thigh also reproduces the symptoms. or extending the thigh posteriorly, which stretches the nerve, may reproduce or worsen the paresthesias. This is done by deep palpation of the anterior superior iliac spine. Deep palpation of anterior superior iliac spine reproduces the symptoms. This test is considered very sensitive [93%] and specific [95%]. Nerve conduction and electrodiagnostic studies are not routinely done. The studies are contemplated when there is no identifiable risk factor, a mass lesion in retroperitoneal space or if back pain is also present. The studies help to rule out upper lumbar radiculopathy. The probable cause of the condition should be addressed. The cause if could be removed is the best form of treatment. Most of the patients have mild symptoms which could be treated by non-operative means. Patients should be asked to wear loose clothing and advised to lose weight if obese. Focal nerve block at the inguinal ligament with anesthetic agent and steroids relieve the symptoms temporarily for several days to weeks. Carbamazepine or gabapentin may help in few patients but are often ineffective. Surgical decompression is indicated in people who are not relieved by nerve blocks. In spite of treatment, numbness may persist for some time.